Newly released Splatoon packs one hell of a punch, and it stands firm to the statement that the ink is mightier than the sword, er, bullet, er, blob of paint?! Splatoon was recently released for the Wii U – to be more exact, at the end of May; and since its launch it has garnered a huge on-line community. If you have a Wii U and you don’t already own a copy of Splatoon, you’re missing on one of the best shooters on the market. Forget about Call of Duty, and Battlefield, playing Splatoon offered me more fun than any other shooter that I’ve played in the past 10 years. The light-hearted, sugar coated, eye candy, lovable Splatoon is a game for casual gamers, or at least, it was at first, until everyone seemed to flock around its greatness. It offers the third person shooter gamer exactly what it wants – to have mindless fun, in a intuitive, and awesomely designed medium. It doesn’t matter if you’re a newbie, or a die hard gamer, you’ll have the time of your life playing Splatoon. If you’re looking for a game that doesn’t involve killing your opponent, and if you’re sick and tired of all the dark and gritty shooters that have plagued the video-game industry, Splatoon is going to be the most refreshing, and joyous event of your gaming experience. Single-player will teach you the basics, and like every other game on this planet, I highly recommend you to give it a thorough playthrough before jumping on the multiplayer bandwagon. There isn’t much to say about the single-player experience. You’re an inkling living in the city of Inkopolis – a colourful little place ruled by The Great Zap Fish. Your beloved king has been kidnapped by the evil minded Octarians – octopus-human hybrids that desire Inkopolis for themselves. You have to teach them what sharing really is by kicking their butts. The single-player experience is quite short, but it offers some unique levels, and a couple of bosses to fight through. 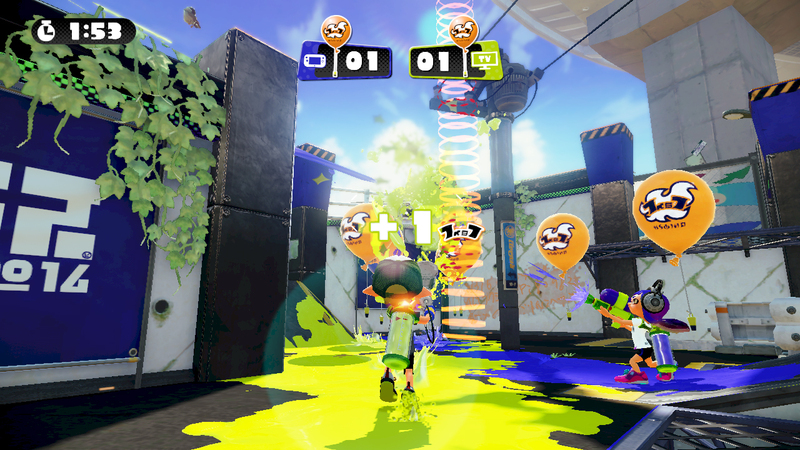 Splatoon’s multiplayer is where the awesome fun is at. Nintendo knows how to develop a game that will be loved by the young, and old alike. Once you finish the campaign, and save The Great Zap Fish from his untimely demise, you’ll jump straight to the Turf Wars. Turf Wars is how you battle for power in multiplayer. It’s highly explicative – you need to paint the map, and kick the other team out. Paint as much of the ground as you can. Remember that every corner counts, and at the end of the 3 minute round the victor will be announced. Steal coverage from your enemies, get your territory back, and snipe them out of the game. The thing is, after you’ve finished your first match, you’ll be craving for more, and Splatoon rewards gamers that push through their limits – every small victory will lead to you being the reigning king. Don’t be just a sharpshooter, think of ways to win the round fast, and safe – there are a ton of modes at your disposal; you only need to unlock your creativity. Once you hit level 10, you can start ranked battles called Splat Zones. 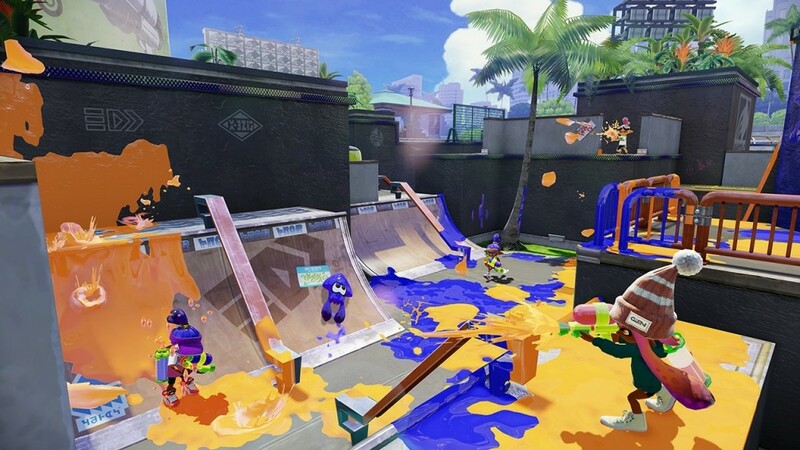 Splat Zones are completely different from Turf Wars, and you will be tasked with coordinating with your team in a sort of king of the hill mode, and keep a zone painted with your colour for as long as you can. When the timer ends, the team who has held the zone the longest wins the match. Of course, there are other games modes, and Nintendo devs are known for offering free post-launch goodies – Splatoon isn’t excluded from this. In Tower Control you need to make the mobile tower move towards a specific zone in your enemy’s territory. There is no info regarding Rain Maker yet! 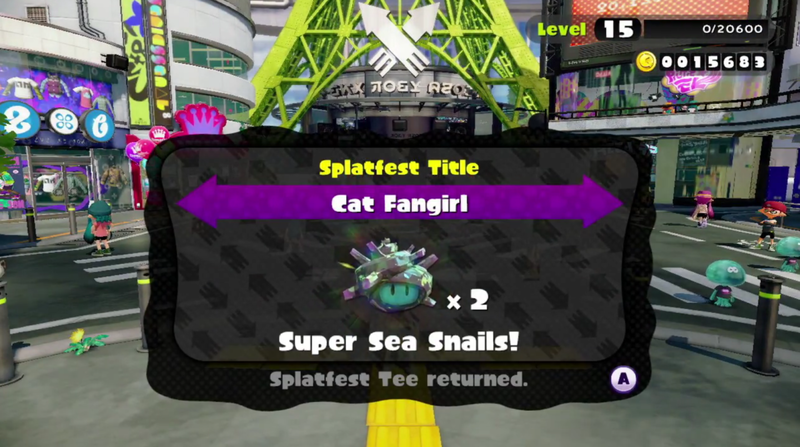 Players can also be a part of an event called Splatfest. These are special dev events, and you need to choose sides – for example coffee lovers versus tea lovers, or red versus blue, you get the point. The team who wins the event, will rack up some pretty nice goodies like special items used in upgrades. Each and every time a match is completed, and also during the match, you get points, that you can use to buy upgrades, headgear, guns, footwear, and of course shirts – points also help you level faster. It may seem all good, but unfortunately it isn’t. Don’t get me wrong, I love the game, and as soon as I’m finished with writing this piece, I’ll jump straight into some multiplayer action, but I’m kinda’ getting bored of the same five maps – maybe because I’ve only been playing Splatoon for the past week, but five maps is seriously not enough for this kind of game. I know, Nintendo won’t disappoint, and they’ll surely add more content. 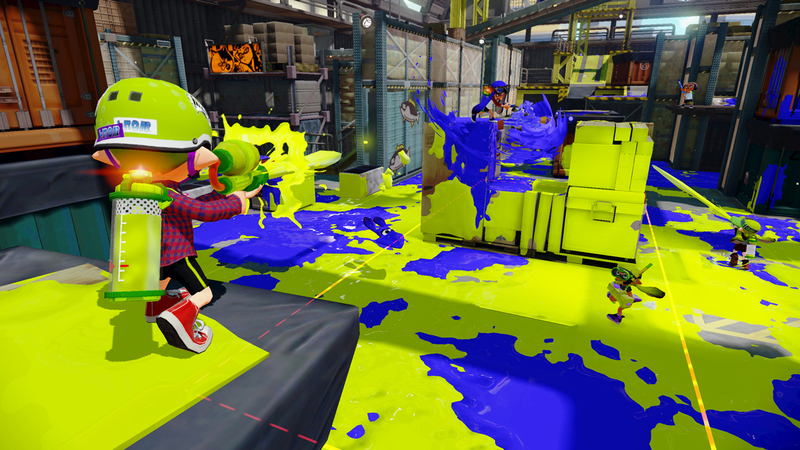 Splatoon will cover you in ink, and you’ll love every second of it. Mark my words!